British pilots were Vincent Nichol in a Fairey, Harry Hawker in a Sopwith, Squadron Leader Basil.D.Hobbs in a Sea Lion, and a substitute, Captain Hamersley, in an Avro. France was represented by a Nieuport flown by Casale and a Spad flown by Sadi Lecointe. Italy, participating for the first time, was represented by a Savoia S.13 flown by Janello. The race was frustrated by an intense fog. Casale and Lecointe had float problems. 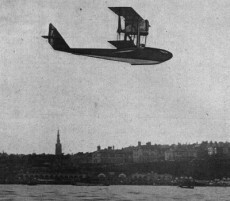 Janello was the only pilot to complete the race, but it wound up in dispute. The referees at the Swanage bend asserted that Janello did not round the buoy correctly. The former, said that the error was due to bad organization and that a non-official boat had cheated him. Mr Lorenzo Santoni, SIAI president (manufacturer of the S.13) regretted that the pilots did not receive information about weather or the starting order; and did not have a boat for contact with the technical team. Janello was disqualified and the race was declared No Contest. Despite this, Italy was designated as the host country for the next race.